Winter is coming! That means it's Porter time and what better place to start than Latvia, the home of the Baltic Porter. I first had this beer in a can in Riga and now it has been brought out in Australia and I've seen it around at a few places. Today's beer is pictured in one of my favourite glasses, the gold rim around the bottom of the glass depicts the heritage listed skyline of Riga's Old Town. Baltic Porter's are typically stronger than your average Porter and have strong roast and/or smoked characteristics. Hopefully this beer is as good as I remember it is. Aldaris Porteris pours a very dark brown colour with a good sized head of light khaki foam on top. The head has a number of small bubbles in it shortly after pouring, although the retention is still very good. There was almost half a finger of foam left at the conclusion of drinking. The glass is well laced by the head, which I can't recall being common for the style. In my eyes it's a pretty looking beer, but maybe that's just the glass! On to the nose and it doesn't disappoint. There is some roasted malt aromas as well as some smoke, however the real champion of the nose is these sweeter malts, which have a combined aroma of caramel and toffee with this slightly odd banana-ey finish. As the beer warms elements of dark fruit begin to become more prominent. Aldaris Porteris certainly doesn't have your standard Baltic Porter nose, but it's still appealing. It is a particularly difficult beer to describe, initial sweetness is at times overwhelmed by an odd roasty sourness. Somehow though this works. I can't quite explain how it works but the constantly changing flavour keeps the beer interesting. 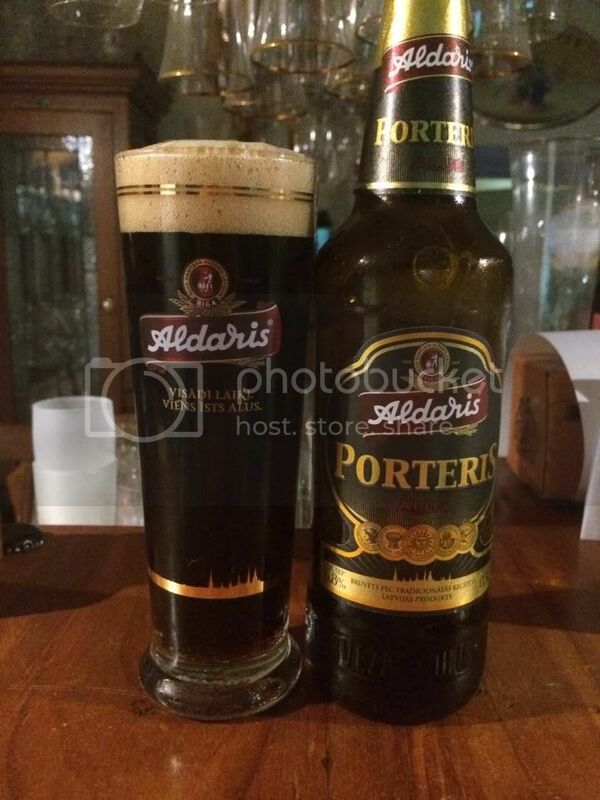 Chocolate, roast malts, some dark fruits and even a little licorice are all noticeable flavours of Aldaris Porteris. The body is on the thinner side of medium, with adequate carbonation present. Overall, I really enjoy Aldaris Porteris. It is by no means the best example of a Baltic Porter but it certainly is an enjoyable one to drink. The thinner body of this beer makes it eminently sessionable as Porter's go. At 6.8% it provides a kick without the knockout high ABV of many other Baltic Porter's which clock in at over 10%. If you're a lover of dark beers, this would be one to try with low expectations.